Brief Introduction to Current Transformers, and Its Applications. In part 5, we talked about the concept of CT saturation, including a brief overview of the various parameters involved. 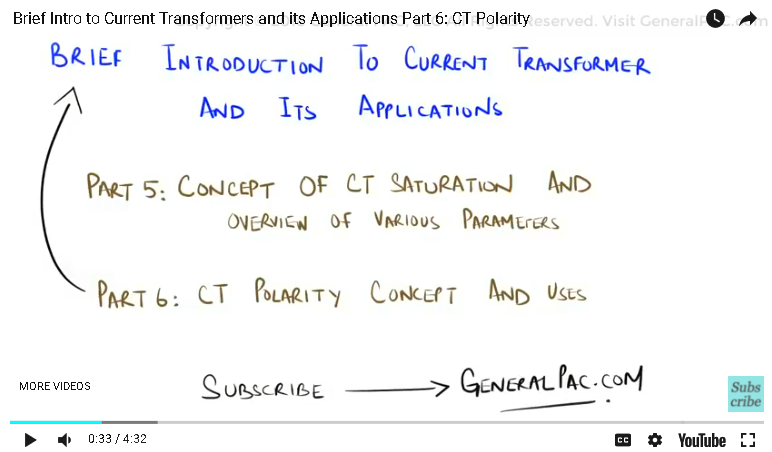 In part 6, we will discuss the concept of CT polarity, and how it can be used to properly connect the CT with metering devices and protective relays. Let us start by first establishing the basic concept of polarity. In simple terms, polarity means the direction of the voltage present between the “high voltage terminal” and the “low voltage terminal”. We can also refer to it as the direction of the current flow in the primary and the secondary windings. There are two types of polarities available. 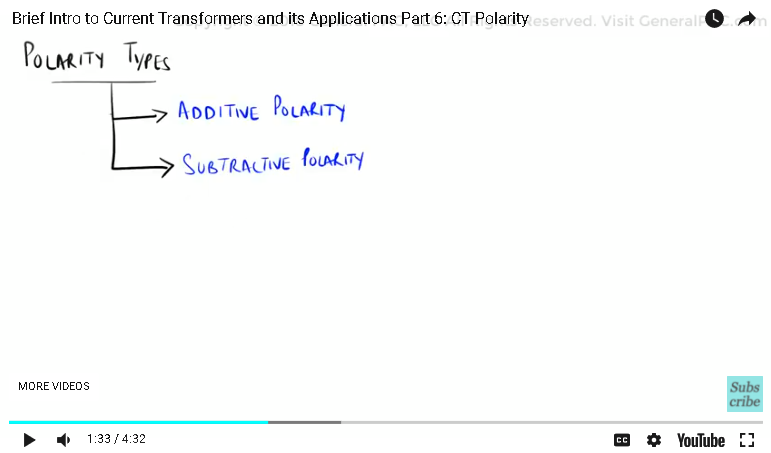 On one hand we have the “additive polarity” and on the other hand we have the “subtractive polarity”. 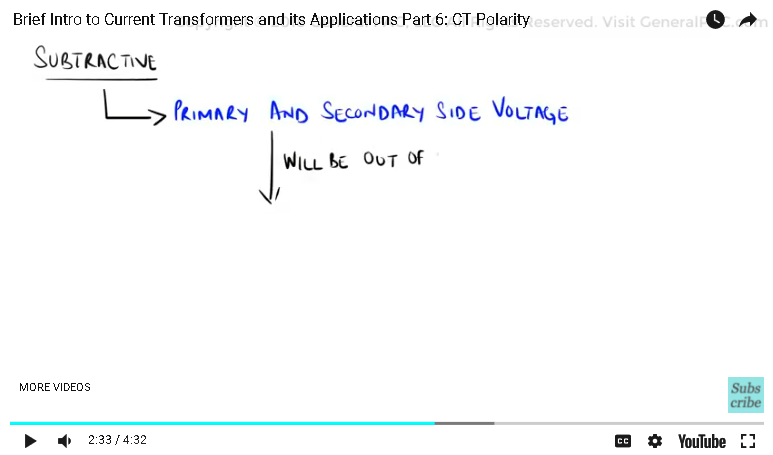 Let us now draw an ideal model of a current transformer in order to understand how “polarity” works. 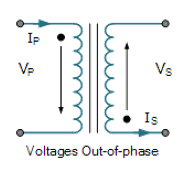 We have a primary voltage “Vp” and a secondary voltage “Vs”. Let us first consider the example of the “additive polarity”. We will be using the dot convention for these examples. Keep in mind that there are other conventions available which will be discussed in detail in another series. 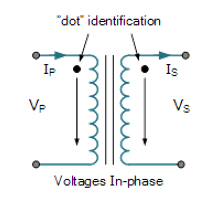 Coming back to our example, when we say “additive”, it means that both of the voltages present on the primary and the secondary side will be in phase. In other words, they will have a phase shift of exactly “zero degrees”. We show the additive polarity by drawing dot markings on the top ends of the primary and secondary windings. If we look at the flow of the current, then the primary terminal current “Ip” will be in phase with secondary terminal current “Is”, and therefore, they will have the same direction of flow. On the other hand, if we consider subtractive polarity, then it means that the primary and the secondary voltage will be out of phase. In other words, they will have a phase shift of exactly “180 degrees”. We can observe subtractive polarity by drawing a dot marking on the top end of the primary winding. However, for the secondary winding, the dot will be marked on the lower end instead. This is to show the out of phase characteristic. If we look at the flow of current, then the primary terminal current “Ip” will be out of phase with the secondary terminal current “Is”, and therefore, they will have the opposite direction of flow. But, what would happen if we were to connect a CT in the opposite polarity to any equipment. 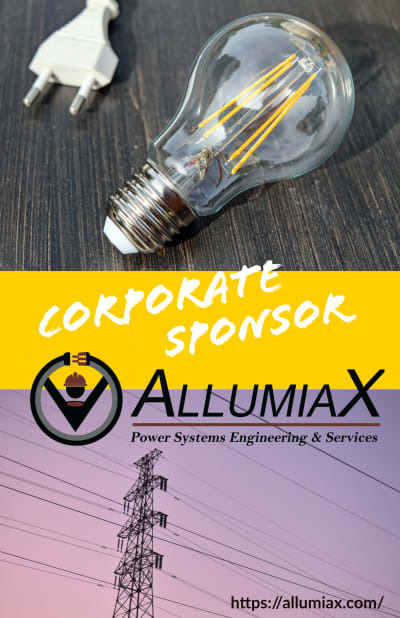 Well, it would cause great amounts of energy being transferred inside the transformer core, which could potentially damage the current transformer itself. So, a good engineering practice is to always test a current transformer’s polarity before performing external connections. The only case where CT polarity is of least concern to us, is when we connect the CT to non-directional relays. 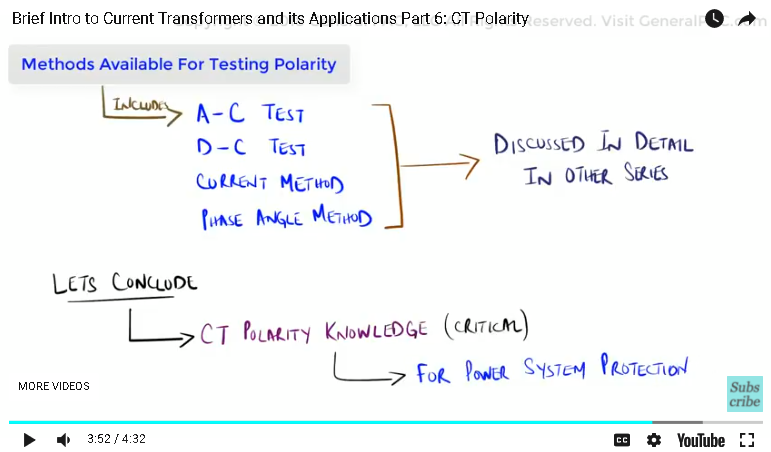 There are various methods available to test a transformer’s polarity. Some of the more common ones include the “A-C Test”, the “D-C Test”, the “Current method and the “Phase Angle method”. We will be discussing these techniques in more detail in another series. In conclusion, knowledge of CT polarity is critical for power systems protection. Other conventions and polarity tests will be discussed in more detail in a dedicated topic for CT polarity. In part 7, we shall talk about the importance of understanding the concept of CT grounding.